Founded in 1883, Reinhardt University is a private, comprehensive institution grounded in the liberal arts and affiliated with the United Methodist Church. Reinhardt offers 40+ graduate and undergraduate programs online and on campus, ranging from business and education to music and theater. Reinhardt also offers programs in other centers in the North Georgia region. Reinhardt’s main 525-acre campus is ideally located in Waleska in the heart of Georgia’s high country and nearby the great international city of Atlanta. Named a College of Distinction, Reinhardt graduated in 2017 its largest class in the university’s 134-year history. Reinhardt University is on the move, with more programs and students than ever before. The 2016-17 freshman class was the second largest in the University’s history. Fall 2016 welcomed nearly 1,500 students, including 475 new traditional students and 150 new non-traditional students in adult, online and graduate programs. New programs include a successful Master of Fine Arts in Creative Writing, which began in the summer of 2016 with a low-residency component. The online Bachelor of Business Administration also was launched successfully. Cybersecurity and Computer Forensics Concentration is off to a great start with the curriculum being approved and recruitment underway for Fall 2017 classes. The Bachelor of Science in Nursing program is building with the hiring of the school dean, Dr. Glynis Blackard, and the Georgia Board of Nursing giving the program “developmental approval.” The program is expected to launch in January 2018. Reinhardt University welcomed its 20th – and first female – president in 2015. Dr. Kina S. Mallard wasted no time in getting started, organizing a leadership team and planning for Reinhardt’s future. She embarked on projects and implementations that would make students’ Reinhardt Experiences even better, from the first-year experience to graduation day. Within her first year, Dr. Mallard had plans in the works for new programs, including a Bachelor of Science in Nursing and a new Nursing Building to go along with it. The University also unveiled plans for a new theater for the burgeoning School of Performing Arts, and the Office of Advancement launched a fundraising campaign to make the project possible. Lake Mullenix continues to undergo a beautification project to allow students a place to unwind, relax and enjoy. It features cascading ponds, an illuminated fountain and a walking path carved around the circumference of the lake. Like its founding fathers, Reinhardt continues to respond to the educational needs of North Georgia. On June 1, 2010, Reinhardt College became Reinhardt University, thus beginning a new chapter in the institution's long, proud history. As a comprehensive university firmly grounded in the liberal arts, Reinhardt University offers instruction to men and women in a Christian environment at its main campus in the city of Waleska,Georgia, and in various other locations in the State of Georgia. For the 2009-10 academic year, the College reached its largest enrollment to date — more than 1,130 students were welcomed to Reinhardt's main campus in Waleska, and three extended sites in Alpharetta, Epworth and Cartersville. The College announced the creation of two more graduate programs, a Master of Music and Master of Arts in Teaching in Early Education. Associate degrees were added in criminal justice and fire management, and a certificate program in homeland safety management and a Public Safety Institute were created. The College also launched a mathematics secondary education program and approved a theatre program, and selected degree programs were offered in Cartersville and Epworth. In 2009, Reinhardt's success was soaring to new heights. The campus now totals almost 525 acres, of which almost 90 are developed. Students were honored and celebrated during the College's first Convocation of Artists and Scholars, a weeklong celebration of student art, music, research, writing, and leadership. During spring commencement ceremonies, the College honored the first graduates from its MBA program. To remain competitive, Reinhardt's intercollegiate athletics switched to the Appalachian Athletic Conference in summer 2009. "The Past Has Been Written, and a New Chapter Begins"
2008 brought much promise to the continued success of Reinhardt University. The College's undergraduate accreditation was reaffirmed by SACSCOC, and, later in the year, Reinhardt was accredited as a level III-graduate institution. New degree programs included: World Languages and Cultures, criminal justice, and professional communication leadership. The year 2008 marked the 125-year anniversary of Reinhardt's foundation. The College hosted many events to commemorate this momentous event, including a kick-off celebration dinner in January, which also included the conclusion of an $18.7 million capital campaign, a Trustee, Faculty and Staff picnic in April, and a 125th Anniversary Scholarship presentation on Honors Day. Reinhardt added its first graduate program - a master of business administration - in 2007 after formal approval from SACS. The College now offers more than 40 degree programs - including undergraduate programs ranging from business, communications and education to psychology, music and math. In 2009, the Master of Arts in Teaching in Early Education was added, and the Master of Education in Elementary Education and Master of Education in Special Education were approved to start in 2012. A baccalaureate program in theatre studies also was added in 2009. Programs continued to be added, including a baccalaureate in political science in 2011, online degree completion programs in criminal justice and healthcare administration in 2012, a Master of Public Administration in 2013 and a Master of Fine Arts in Creative Writing in 2016. In fall of 2006, Reinhardt welcomed a record breaking number of new students to campus - 373 - up from 313 in 2005. The Capital Campaign, announced in 2005 with a goal of $15 million, raised its goal in 2006 to $17 million and surpassed that goal in 2007 with almost $22 million, including $3,286,187 in gifts for the Annual Fund and $18,681,664 in gifts for the Capital Campaign. In 2000, the Commission on Colleges of the Southern Association of Colleges and Schools (1866 Southern Lane, Decatur, GA 30033-4097: Telephone number 404-679-4501) accredited Reinhardt to award associate and baccalaureate degrees, and in July 2008, the College's accreditation was reaffirmed to award associate and baccalaureate degrees and a master in business administration degree. The University Senate of the United Methodist Church approved Reinhardt to be listed as a United Methodist-affiliated institution beginning in 2000. Reinhardt began offering its first four-year degree program in business in 1992, and in 1994 the College became accredited as a four-year institution. In 2010, it was granted University status. In 1920, Reinhardt fielded a football team for a short time and although the campus's first gymnasium was constructed in 1931, men's intercollegiate basketball did not begin on campus until 1982 when the James and Sis Brown Physical Education Building was constructed. Women's basketball and softball were then added in 1983, men's soccer in 1991 and women's and men's cross country and tennis in 1999. The beginning of the 21st century included the additions of women's soccer in 2000 and men's baseball and women's fast-pitch softball in 2004. Women's volleyball was added in 2003 and golf in 2007. The College also became a member of the National Association of Intercollegiate Athletics (NAIA) and the National Christian College Athletic Association (NCCAA). In 2010, women’s lacrosse was added, and in 2013, the Eagles football team competed for the first time on the athletic field, after being approved in 2012. Men’s and women’s track were added in 2014. The 2016-17 school year brought the addition of wrestling and bowling. A gracious donation from the Brown-Whitworth Foundation made possible a renovation of the University’s “blue gym” to a wrestling facility, and a partnership with the Canton-based Cherokee Lanes’ owner gave the Eagles not only a place to practice and compete but a coach as well. 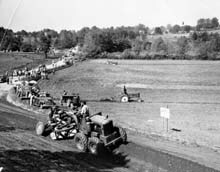 A major "face-lift" of the College's farm land was completed in 1949, during one of the most memorable days in Reinhardt's history, "Soil Conservation Day." On May 18, 1949, U.S. Vice President Alben Barkley visited the College's campus for the event, and more than $100,000 in improvements were completed in that single day. Among the amazing accomplishments of the volunteers on Soil Conservation Day were the construction of an athletic field, the landscaping of four buildings, the erection of five miles of fencing, the spreading of 200 tons of limestone and 40 tons of fertilizer and the planting of two tons of corn and grass seed. In the early 1900s, additional farmland was purchased by the College to bring its total acreage to approximately 500. The farm furnished employment for students working their way through school and produced a large portion of the food needed in the dining hall. A herd of dairy cattle was obtained in 1929 and, in 1940, a canning plant was installed on campus to preserve summer's surplus of fruits and vegetables for winter. By 1910, more than 390 students were enrolled at Reinhardt. On November 28, 1911, the chapel and administration building were destroyed by fire. A "new Reinhardt" emerged from the fire, and the "Normal" was dropped from the institution's name. In 1920, a second year of post-secondary education was added to Reinhardt's curriculum to make the institution a full-fledged co-educational junior college. The first college students graduated in 1921 from Reinhardt. As the local public school system developed, the grammar school became administered by the County, though it remained on campus until 1948 when R. M. Moore Elementary School opened. High School students were transferred to Cherokee High School in 1956. Debating societies became an integral part of student activities on campus. The Rev. C. E. Pattillo, president of the College from 1891-94, organized the Henry W. Grady Debating Club in 1891 and, in 1892, it was divided into the Pierce and Haygood Societies, named after two famous Methodist bishops. 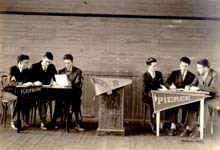 The Delphian Literary Society was then established for girls and, in 1894, it split into Phi Alpha and Phi Delta. These debating societies were the backbone of student activities until the late 1960s when they were replaced by fraternities and sororities. Reinhardt received a charter in 1891 from the Georgia State Legislature that granted the school the official name of Reinhardt Normal College. At that time, approximately 200 students were enrolled at the College, including elementary- to college-aged children. Military companies were established at Reinhardt in 1893 and, in 1897, military training became mandatory for all able-bodied male students except those preparing for the ministry. In the spring, the military companies would stage battles on a field or pasture. One company would hold a fort on the top of the hill while the other companies attacked. Firecrackers and blanks were even sometimes used for realism, and occasionally female students would join the performance, acting as nurses and aiding the "wounded." The first Board of Trustees was appointed at Reinhardt in 1889. It consisted of A.M. Reinhardt, John J. A.Sharp, J. M. G. Heard, Joseph M. Sharp, Elias Alexander Fincher and the Rev. Wilbur Fisk Glenn. The College's curriculum, designed to train teachers and preachers, focused on language, mathematics, science, history and religion. The first class graduated in 1888 with four members: Fredonia Blanton (niece of A.M. Reinhardt), William Alonzo Covington and John J. A. Sharp's niece and nephew Joseph A. and Lucy Sharp. These graduates turned out to be an extremely distinguished class: Blanton spent more than 40 years as a teacher at Reinhardt, Covington became a judge, Joseph Sharp became president of Young Harris College, and Lucy Sharp married Dr. R. M. Moore, a doctor and civic leader for whom the local elementary school is named. In 1883, Augustus Michael Reinhardt and John J.A. Sharp decided to start a school in Waleska to offer an education to the children of this Civil War-ravaged area. Reinhardt traveled to Dalton, Ga., to appear before the North Georgia Conference of the Methodist Episcopal Church South to ask for their support in providing a teacher and preacher for the school. The Church agreed and sent the Reverend James T. Linn to Reinhardt Academy, which had been named in honor of Augustus' father, Lewis W. Reinhardt. In January of 1884, Reinhardt opened its doors for classes in an old cabinet and wood shop with approximately 40 students, ranging from grammar school to high school. 2018 - Established the Cauble School of Nursing in Health Sciences, with a gift from Dr. John Cauble and Sally Forrest. Highest enrollment in history of 1,566 in fall 2018. Inducted inaugural class into Cauble School of Nursing. Fraternity and sorority life added to student involvement. Dedicated Townsend Bridge, donated by Dr. Austin Flint. Reinhardt Chamber Singers invited to sing at the Vatican in Italy. Cobb Hall is demolished. Construction is completed on Eagles View residence hall, Gordy Dining Center expansion and Reinhardt Theater. Reynolds Wayside Chapel added to campus. Dedicated Simms Garden. Reinhardt certified through National Council for State Authorization Reciprocity Agreements to educate nationwide. Ranked 25th in U.S. News and World Report, an increase of 20 spots since 2016. Dr. Walter May became Dean of Students. Conferred the first 12 MFA degrees in Creative Writing. 2017 - Dr. Mark A. Roberts installed as Reinhardt’s 1st provost. Highest enrollment in history of 1,508 in fall 2017. Received $1 million gift from Austin and Bea Flint in support of a new endowed scholarship for music students. Falany Performing Arts Center concert hall named “Flint Hall”. Hill Freeman Library renovated with $1 million in support from the Cherokee County Commission. Received funding from a USDA loan for a $24 million construction project including a 300-seat black box theater, Eagle View residence hall, and expansion of the Gordy Dining Center. Launched the BSN housed at the Appalachian campus of Chattahoochee Technical College in Jasper, GA. Launched A Day for Reinhardt in Pickens County to provide scholarships for students in Pickens County. Launched Reinhardt Women’s Leadership Program. Completed a SACSCOC substantive compliance certification for reaffirmation of accreditation including a quality enhancement plan named Where in the World RU Going with a focus on high impact practices. 2016 - Dr. Kina S. Mallard is inaugurated as Reinhardt’s 20th president. Highest enrollment in history of 1,484 in fall 2016, representing a nearly 30% growth since 2011. University breaks ground on Theatre Building. Men’s and women’s bowling and men’s wrestling added. Blue Gym renovated into a wrestling facility for practice and matches. 2014 - Men’s and women’s track and field are added. New athletic indoor practice facility built adjacent to the Field House. A new stage arts annex is also being discussed. 2013 - Master of Public Administration launches. Adds marching band. Football begins intercollegiate competition and finishes 6-4 and on top of the Mid-South Conference West Division. Dedicates new Science Center, and Blue and Gold Halls open as part of the Hubbard Hall Residential Complex. School of Music changes to School of Performing Arts, the only one of its kind in Georgia, and the theatre program moves to the renamed school. 2012 - Hubbard Residence Hall, turf field, field house and Ken White Music Center open fall 2012. MBA offered at new off campus site in downtown Woodstock, Ga. Online degree completion programs in criminal justice and healthcare administration added. Football players begin practice. Construction begins on new Science Center. Monument sign at corner of Highways 108 and 140 replaced. Plans finalized for two new residence halls to be part of the Hubbard Hall complex. 2011 - Approves the addition of football to begin practice in 2012 and competition in 2013. Adopts plans to build a field house, turf football field and residence hall. Adds baccalaureate program in political science. 2010 - Becomes Reinhardt University on June 1. Adds women’s lacrosse. Master of Education in Elementary Education and Master of Education in Special Education approved to start in 2012. Adds baccalaureate program in theatre studies. Lights were added to the Ken White Athletic Fields. 2009 - Holds first Convocation of Artists and Scholars. Adds associate degrees in criminal justice and a Public Safety Institute. Intercollegiate athletic teams switch to the Appalachian Athletic Conference and add men’s lacrosse. Launches math secondary education program. Offers selected programs in Cartersville. Adds Master of Arts in Teaching in Early Education. 2008 - Celebrates 125th anniversary and concludes an $18.7 million capital campaign. SACS reaffirms Reinhardt's undergraduate accreditation and, later in the year, accredits Reinhardt as a level III-graduate institution. Adds new programs in World Languages and Cultures, criminal justice, and professional communication leadership. 2007 - SACS approved first graduate program – Master of Business Administration. Hasty Student Life Center completed. Women’s golf added. First endowed faculty chair, the William W. Fincher, Jr. Chair of the Visual Arts, was funded. Baccalaureate programs in math and digital art and graphic design, and concentration in special education, added. 2006 - Ground broken for Hasty Student Life Center. New baccalaureate programs in biology, English and music education approved. Capital Campaign goal raised to $17 million. Recruiting begins for women’s golf team. Record number of new students welcomed to campus. 2005 - Added public relations and advertising; marketing; media, culture and society; and public safety leadership, thus bringing the number of degree programs to 33. The $15 million Capital Campaign announced. 2004 - Apartment-style residence halls open at capacity. Baseball and fast-pitch softball added. 2003 - Added women’s volleyball. Dedicated the renovated and expanded James & Sis Brown Athletic Center and the Jim & Syble Boring Sports Complex and the expanded and renamed Hill Freeman Library and Spruill Learning Center. 2002 - The Floyd A. and Fay W. Falany Performing Arts Center, which included the relocated McCamish Media Arts Center, opens. Added baccalaureate programs in English, history, music, religion, as well as a management concentration.Dr. J. Thomas Isherwood was inaugurated as Reinhardt’s 19th President. 2001 - Student programming expands to include outdoor program. Dedicated the Fred H. and Mozelle Bates Tarpley Education Center, the George M. McClure Water Treatment Plant and the renovated Varsity Room.Dr. Charles E. Glassick was appointed as Reinhardt’s interim president. 2000 - Added sociology, sports information and communications. North Fulton Center moves to Alpharetta, Ga. Women’s soccer added. Cartersville Center closed. 1999 - Added baccalaureate programs in art and psychology, as well as accounting and information systems concentrations. Began athletic competition against other four-year schools and added tennis and cross country. Opened the F. James and Florrie G. Funk Heritage Center. Launched institutional and athletic logos.Dr. William A. Nevious was inaugurated as Reinhardt’s 18th president. 1998 - College switches to semesters. Baccalaureate program in education begins. $20 million Capital Campaign concludes and raises $30.5 million. William W. Fincher Jr. and Eunice L. Fincher Visual Arts Center built. 1997 - Baccalaureate programs in biology, communication and liberal studies added. Dobbs Science Building renovated. Cartersville Center opened. 1996 - Norman W. Paschall Plaza completed. Chatsworth Center closes. Dr. Newt Gingrich, who began co-teaching a Reinhardt history course in 1994, is named U.S. Speaker of the House. 1995 - North Fulton Center moves to Roswell Mall. 1994 - First two bachelor’s degrees awarded in business, and Reinhardt is accredited as a baccalaureate institution. 1993 - George M. Lawson Academic Center and McCamish Broadcast Center open. 1992 - Baccalaureate program in business administration began. Innovative campus-wide computer/video/phone network installed. 1991 - Evelyn Gordy Hospitality House moved from Atlanta to Campus. Intercollegiate soccer added. 1988 - Joseph Baxter Recreation Center built. First A Day for Reinhardt raises scholarship funds for local students. 1987 - Hagan Chapel (Waleska United Methodist Church) built. North Fulton Center opened in Roswell. 1986 - Bratton Carillon Tower built. 1985 - W. Frank and Evelyn J. Gordy Center opens. 1984 - Dr. Floyd A. Falany was inaugurated as Reinhardt’s 17th president. 1983 - Women’s basketball and softball added. Centennial Celebration held. 1980 - Lake Mullenix built. 1977 - Hal B. Wansley President’s Home built. 1975 - Chatsworth Center opens. 1973 - Dr. Allen O. Jernigan was inaugurated as Reinhardt’s 16th president. 1969 - Hill Freeman Library, Cobb Hall and Roberts Hall built. 1957 - Student government association founded. 1956 - High school grades transfer to Cherokee High School. Honors Day Program was inaugurated. 1951 - Burgess Administration Building completed. 1949 - U.S. Vice President comes to “Soil Conservation Day.” In one day, 1,000 U.S. veterans and volunteers made almost $100,000 in improvements. 1944 - Dr. James Rowland Burgess, Jr. was inaugurated as Reinhardt’s 15th President. 1942 - Road paved from Canton to just east of Waleska. 1939 - Paul Jones Hall built. 1929 - Electricity from Georgia Power comes to Reinhardt. Stock and dairy barns built. Students often work on the College farm to pay their way. 1927 - Reinhardt is accredited as a junior college.Professor William M. Bratton was inaugurated as Reinhardt’s 14th President. 1926 - Samuel C. Dobbs Science Center built. 1925 - Public school system assumes responsibility for the grammar school, but the classes continue to meet on the Reinhardt campus until 1948. 1924 - The first issue of The Hiltonian, the student newspaper, was published in May. 1922 - Professor Ramsey Colquitt Sharp was inaugurated as Reinhardt’s 13th President. 1917 - Professor E.P. Clark was inaugurated as Reinhardt’s 11th President. 1918 - The Rev. Thomas M. Sullivan was inaugurated as Reinhardt’s 12th President. 1916 - Campus power plant built. 1914 - Enrollment has grown to 340 pupils; 51 were in college classes. 1912 - Water system installed. 1911 - Reinhardt becomes a college. 1906 - First car driven on Campus. 1904 - Telephone installed in Waleska at President’s Home. 1903 - First business class offered. 1901 - First loan fund, "the Field Loan Fund" was established to help "worthy boys and girls get an education regardless of their conditions and surroundings." Professor Ramsey Colquitt Sharp was inaugurated as Reinhardt’s 10th President. 1897 - Dr. Richard W. Rogers was inaugurated as Reinhardt’s ninth President. 1896 - The Reverend J.S. Embry was inaugurated as Reinhardt’s eighth President. 1895 - Professor E.A. Cole was inaugurated as Reinhardt’s seventh President. 1893 - Military companies were established. Sham battles between the companies were staged in the spring, and female students played the parts of nurses, who would rush into the scene of battle to nobly administer treatment. One afternoon of each commencement was dedicated to these battles. By 1897, military training was compulsory for boys. Each military unit also had a baseball team, which was the chief sport at the school at the time. 1891 - Legislature of Georgia grants a charter which changes Reinhardt's name to Reinhardt Normal College. The property was valued at $5,000. The Rev. C.E. Patillo was inaugurated as Reinhardt’s sixth President. 1890 - The Henry W. Grady Debating Club for boys and the Delphian Literary Society for girls were established by then Reinhardt President the Rev. C.E. Patillo. In 1892, it divided into two societies, the Pierces and the Haygoods, after two famous Methodist bishops. In the same year, two debating societies for girls were organized: the Phi Alphas and Phi Deltas. The Rev. R.F. Eakes was inaugurated as Reinhardt’s fifth President. 1889 - Reinhardt buildings and grounds are deeded to the North Georgia Conference of the Methodist Church. 1888 - First commencement held for four graduates. Early commencements are community events, lasting several days and including pageants and military drills. The Rev. Hubert Smith was inaugurated as Reinhardt’s fourth President. 1887 - Enrollment totals almost 100 students. Total monthly expenses for a boarding student was about $7. The Rev. C.M. Ledbetter was inaugurated as Reinhardt’s third President. 1886 - The Rev. O.C. Simmons was inaugurated as Reinhardt’s second President. 1885 - First administration building built. In the spring of that year a tornado blew down much of the timber around Waleska, and this lumber was used to build the new structure. 1884 - Reinhardt Academy opens with 12 students in a cabinet shop owned by Mr. M.P. Hollen near the present campus in January, and classes meet there for a year. The school is named for Reinhardt’s father. The first pupils range from elementary to college ages. Between 40 and 50 pupils enrolled in the first school. 1883 - Captain A. M. Reinhardt and his brother-in-law, Mr. John J.A. Sharp, ask the conference of the Methodist Episcopal Church South in Dalton, Georgia, to provide a teacher and preacher for the children of Cherokee County. Reinhardt agreed to be personally responsible for the teacher's salary. The Rev. James T. Linn was inaugurated as Reinhardt’s first President.